The Noble Formula OTC (over the counter) line of products all contain pyrithione zinc (ZnP). Noble Formula products are formulated to relieve the symptoms of itching, flaking, scaling, redness and inflammation caused by psoriasis, eczema, dandruff, lichen planus, seborreheic dermatitis, and other hyperkeratotic skin conditions. 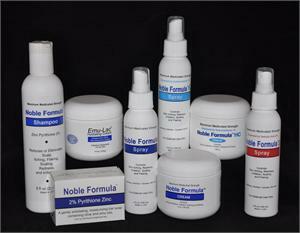 Noble Formula is available in spray, cream, shampoo and bar soap. 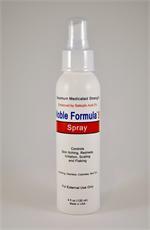 Noble Formula sprays and creams do not require a physician's prescription. They are very effective at suppressing itching, flaking and redness within 4-6 weeks. Noble Formula sprays work well on both skin and scalp, while Noble Formula creams are recommended for the face and sensitive areas. All of our products are made with the highest quality ingredients, no added dyes or fragrances. We do not use animal testing on any of our products. Noble Formula Bar Soaps with 2% pyrithione zinc (ZnP). Noble Formula Cream with .25% pyrithione zinc (ZnP). 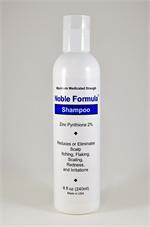 Noble Formula Shampoo with 2% pyrithione zinc (ZnP). 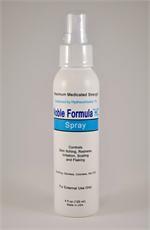 Noble Formula Spray with .25% pyrithione zinc is great for itching, flaking, or inflamed scalp and skin. Noble Formula-HC Cream with hydrocortisone 1%. Noble Formula-S Spray with 2% salicylic acid.